Idamae Thurlow, 87; of Fulton passed away peacefully with her family by her side at St. Luke Health Services, Oswego. She was born in Fulton to the late Levi and Mary (Barton) Brown Sr. Mrs. Thurlow remained a lifetime resident of Fulton. Mrs. Thurlow was past employed with Sealright and as a bus driver with the Fulton Consolidated School System. She was a past president of Columbiettes of St. Joseph’s Council #254 and the Oswego Council Columbiettes #227. Mrs. Thurlow was a life member of the Fulton VFW #569 Auxiliary. A life member of the Parent Teacher’s Association/Erie St. School Chapter, past president of the Towpath Towers Association where she lived and served for several years. 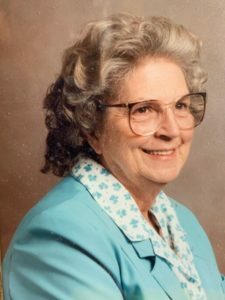 Idamae was an avid volunteer at the Immaculate Conception Church, Fulton and later Holy Trinity Church with BINGO, serving as a money counter, and Bazaar worker. She was a past member of the Volney Seniors. Idamae was a dependable driver for so many of her friends and family for many many years. She was predeceased by her husband Arthur Thurlow in 1986 and her brother Levi C. Brown Jr. Idamae is survived by her beloved family: Joan (Gary Firenze) Thurlow of Volney, Arthur (Linda) Thurlow of FL, Allen (Sue) Thurlow of Oswego, James (Carol) Thurlow of WY, Howard (Patsy) Thurlow of New Hartford, NY, William (Nancy) Thurlow of Fulton, and Robert (Kimberly) Thurlow of Granby, 15 grandchildren: Krissy (Brian) McDermott, A.J. (Serena) Thurlow, Jeffrey (Kelley) Thurlow, Shawna (Scott) Campbell, George (Wendy) Parrott, Richard (Stephanie) Parrott, Ryan Leuthhauser, Ashley (T.J) Corey, Nikki Thurlow, Krysta (Keith) Snow, Gary Firenze Jr., Beth Potocnak, Morgan Firenze, Elizabeth Thurlow, Robert Thurlow Jr., and 16 great-grandchildren, 1great great-grandson and several nieces and nephews. Funeral Services will be held 9:30 AM Thursday at Holy Trinity Church where a mass of Christian Burial will be celebrated by Rev. Joseph Scardella. Burial will be held the spring at St. Mary’s Cemetery, Fulton. Calling hours will be conducted 4:00 to 7:00 PM Wednesday at the Sugar Funeral Home, Inc., 224 W. 2nd St. S., Fulton. We are very sorry for your family’s loss. Take comfort in knowing that “Mom” is now dancing and rejoicing in Heaven with her Lord and Savior, Jesus! My beautiful aunt Idamea Thurlow was a wonderful caring person . I will miss her very much. Even though I was unable to be there in person I will miss you Grandma T goodbye and god bless.